Angus McEwan, Scottish Artist: How did you Paint that? This publication was produced by International artist and it presents 100 different artist's work and the method s they used to create their masterpieces. 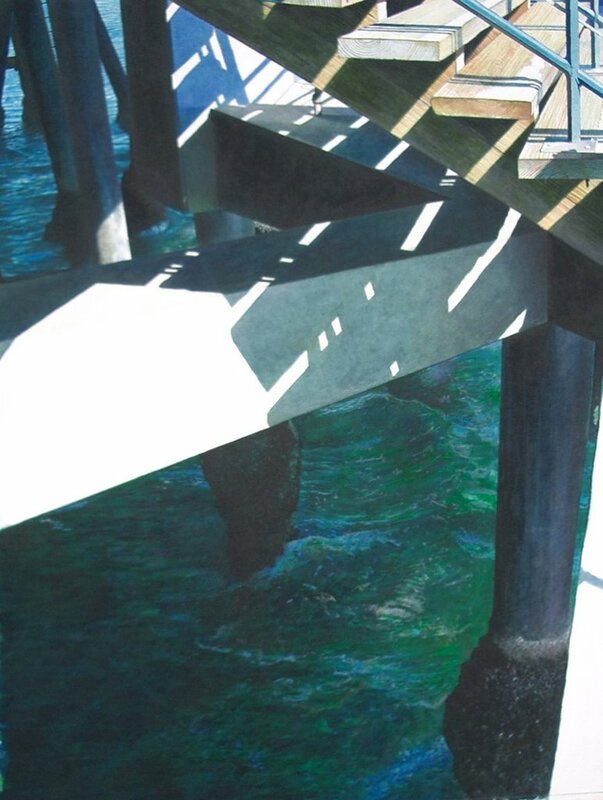 My painting "Under the Boardwalk" was reproduced as Artist 51(not unlike area 51 - a complete mystery). Here is a small note on the inspiration behind this piece. The quality of light I enjoy in Scotland tends to be of a particular steely blue character and when I go abroad the sunlight has a stronger warmer, yellow quality that really intrigues me. Of course it’s not only the sunlight that interests me; it’s the quality of deep intense blue shadows that usually catches my eye. My parents live in Los Angeles and I visit on a yearly basis, occasionally doing a little painting, but most often than not observing. I take pleasure in the quality of light, the Spanish style architecture and the over all Mediterranean feel to this area. When I visited Santa Monica Pier last April, it was fairly windy but the sun was shinning and it really made the sea sparkle and I spent quite a while watching the waves crashing against the legs of the Pier. 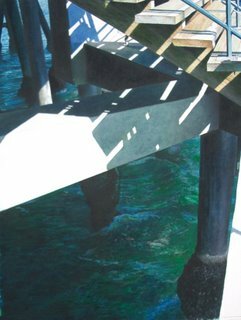 It was the colour; the light; the shadows and the immense power of the sea that attracted me to paint this subject. I often travel abroad with students and have visited in recent years Venice (Italy), Barcelona and Madrid, and it is always the light that captivates me. Any subject matter, no matter what that might be always seems to come alive when the sun hits it. I envy those who enjoy more than their fair share of strong sunlight, it is possibly because I don’t see very much of it that makes me notice it and appreciate it all the more. The shapes of the shadows and strong tonal contrast are my subject matter. I painted on Fabriano Artistico 300g/m2, cold pressed, fine grained, white watercolour paper. In this painting I used a Squirrel mop brushes for painting the water and watercolour sable “round”, size 10 to 000, and square headed one stroke synthetic brushes 1” to ¼”. I also used a “plant” spray gun for applying a bit of splattering in the water area. I used a particularly large amount of different greens in this painting. Chinese Orange; Olive Green; Phthalo Green light; Cobalt Turquoise Light; Indian Yellow; Cinnabar GP Light Extra; Violet Grey; Burnt Umber; Prussian Blue; Cinereous Blue; Mars Yellow. I do use Professional quality watercolours going for colours that are high in saturation, pigment and are proven to be light fast. "How did you paint that?